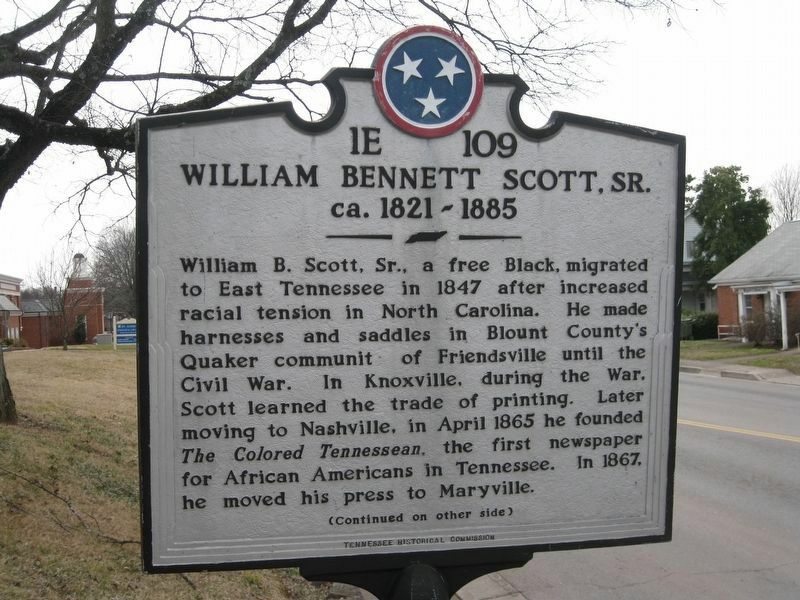 William B. Scott, Sr., a free Black, migrated to East Tennessee in 1847 after increased racial tension in North Carolina. He made harnesses and saddles in Blount County’s Quaker community of Friendsville until the Civil War. 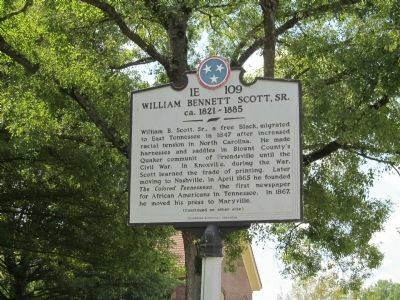 In Knoxville, during the War, Scott learned the trade of printing. Later moving to Nashville, in April 1865 he founded The Colored Tennessean, the first newspaper for African Americans in Tennessee. In 1867, he moved his press to Maryville. 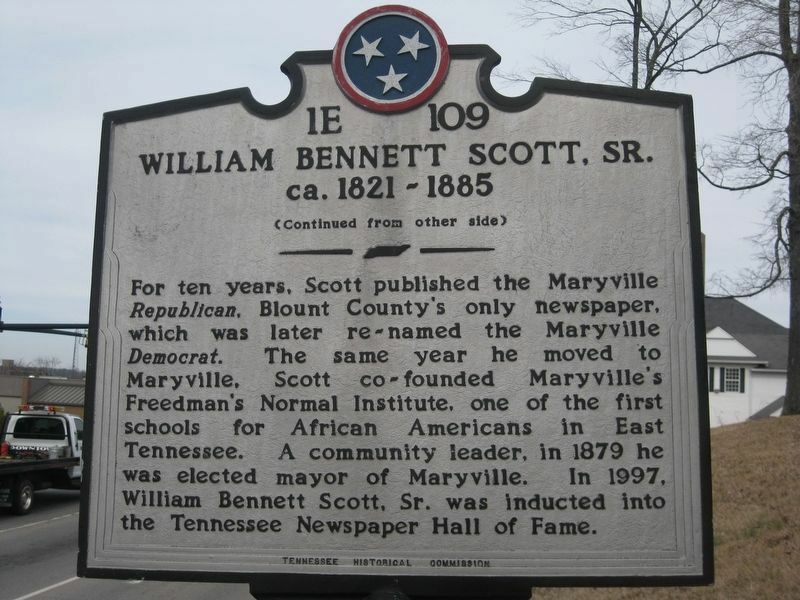 (Continued from other side)For ten years, Scott published the Maryville Republican, Blount County's only newspaper, which was later re-named the Maryville Democrat. Scott co-founded Maryville's Freedman's Normal Institute, one of the first schools for African Americans in East Tennessee. In 1879 he was elected mayor of Maryville. In 1997, William Bennett Scott, Sr. was inducted into the Tennessee Newspaper Hall of Fame. marker is included in the Tennessee Historical Commission marker series. Location. 35° 45.214′ N, 83° 58.412′ W. Marker is in Maryville, Tennessee, in Blount County. Marker is at the intersection of West Broadway Avenue and Gary H. Hensley Drive, on the right when traveling east on West Broadway Avenue. Touch for map. Marker is in this post office area: Maryville TN 37801, United States of America. Touch for directions. Other nearby markers. At least 8 other markers are within walking distance of this marker. 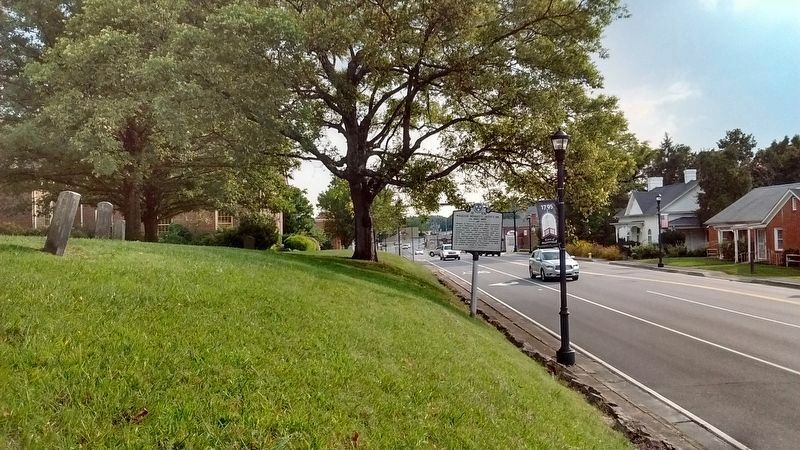 New Providence Church (within shouting distance of this marker); Montvale Springs (about 600 feet away, measured in a direct line); Pride Mansion (approx. 0.2 miles away); Relief of Knoxville (approx. 0.2 miles away); Maryville During the Civil War (approx. 0.2 miles away); Sam Houston Statue (approx. 0.2 miles away); Where Houston Enlisted (approx. 0.2 miles away); Maryville Polytechnic School (approx. 0.4 miles away). Touch for a list and map of all markers in Maryville. More. Search the internet for William Bennett Scott, Sr.. Credits. This page was last revised on September 7, 2017. This page originally submitted on August 27, 2012, by Judith Barber of Marietta, Georgia. This page has been viewed 677 times since then and 18 times this year. Last updated on August 28, 2017, by Tom Bosse of Jefferson City, Tennessee. Photos: 1. submitted on August 27, 2012, by Judith Barber of Marietta, Georgia. 2, 3. submitted on September 4, 2017, by Tom Bosse of Jefferson City, Tennessee. 4. submitted on August 28, 2017, by Tom Bosse of Jefferson City, Tennessee. • Bill Pfingsten was the editor who published this page.